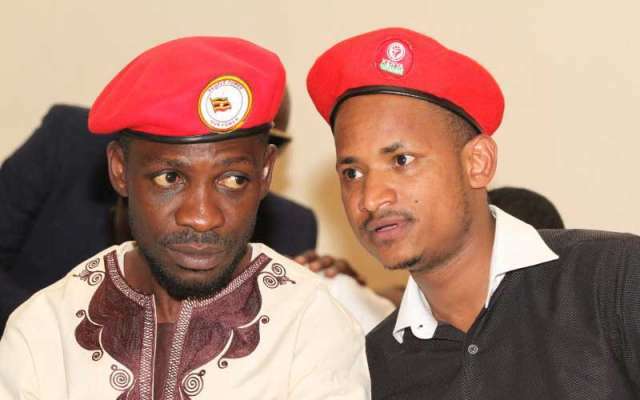 NAIROBI – Mr Babu Owino, the Member of Parliament for Embakasi East, has described as backward and authoritarian the decision by the Ugandan government to ban him from stepping foot in Uganda for the Kyarenga concert hosted by Robert Kyagulanyi, aka Bobi Wine, the MP for Kyadondo East in Wakiso District, near Kampala. The outspoken Owino sought to attend Bobi Wine’s concert to reciprocate the latter’s visit in Nairobi last month in Kenya where took Nairobi by storm – attending talk shows, TV interviews, lectures et al, under the wings of Mr Owino. However, he was blocked by Kampala, which accused him of undermining the President Museveni government. But in a statement issued on Sunday, November 11, Mr Owino said the ban will not deter me from agitating for greater democratic space in Uganda, Kenya and indeed, the entire continent. “This draconian veto came just ahead of my trip to Kampala to attend the Kyalenga Festival yesterday. It is a backward and authoritarian response to my unequivocal support for Honorable Robert Kyagulanyi and the young people of Uganda against the tyranny of President Yoweri Museveni,” he said. He added: “Honorable Bobi Wine and I remain brothers in ideology and no amount of intimidation will stop us from working together to liberate the people of Africa! I wish to categorically state that General Haji’s ban will not deter me from agitating for greater democratic space in Uganda, Kenya and indeed, the entire continent. I will not falter in my pursuit for respect for human rights and the meaningful involvement of the youth in our nations’ affairs.” Bobi Wine, who is behind a ‘people-power revolution’ in Uganda was last month in Kenya to launch a ‘Youth for Africa’ movement. However, Mr Owino said the ban indicates that the government of President Museveni is panicking. I am in receipt of the official communication from the Minister for Internal Affairs for Uganda General Haji Abubakar seeking to ban my travel to Uganda without special clearance from his office. This draconian veto came just ahead of my trip to Kampala to attend the Kyarenga Festival yesterday. It is a backward and authoritarian response to my unequivocal support for Honorable Robert Kyagulanyi and the young people of Uganda against the tyranny of President Yoweri Museveni. I wish to categorically state that General Haji’s ban will not deter me from agitating for greater democratic space in Uganda, Kenya and indeed, the entire continent. I will not falter in my pursuit for respect for human rights and the meaningful involvement of the youths in our nations’ affairs. The arc of the moral universe may be long but it always bends towards justice. President Museveni must know that nothing lasts forever. He has overstayed his welcome and soon, the popular wishes of the Ugandan people will outweigh his use of force and violence. I urge the youth in Uganda not to be discouraged from this minor set back,I will come to Uganda whether the guy is alive or dead. We will overcome!